Homemade cornbread is always ideal, but when you need a quick batch of cornbread, using a ready-made mix—like Jiffy’s Corn Muffin Mix—is the way to go. (If you have a few boxes in the pantry on hand you can have warm cornbread at almost any time.) The way to make it taste more homemade is to add a few ingredients, like cream-style corn, butter, and honey as in this recipe. Preheat oven to 350°F. Spray an 8-inch or 9-inch square pan with cooking spray. In a large bowl, add egg and milk and whisk together with a fork to combine. Add creamed corn and stir to combine. Add the cornbread mix, using a spatula to combine with wet ingredients. Scrape cornbread mixture into the prepared pan and place in preheated oven. Cook cornbread until a toothpick inserted in the center comes out clean, about 25 to 30 minutes. Let cool a bit. In a small bowl, add softened butter and honey and stir to combine. 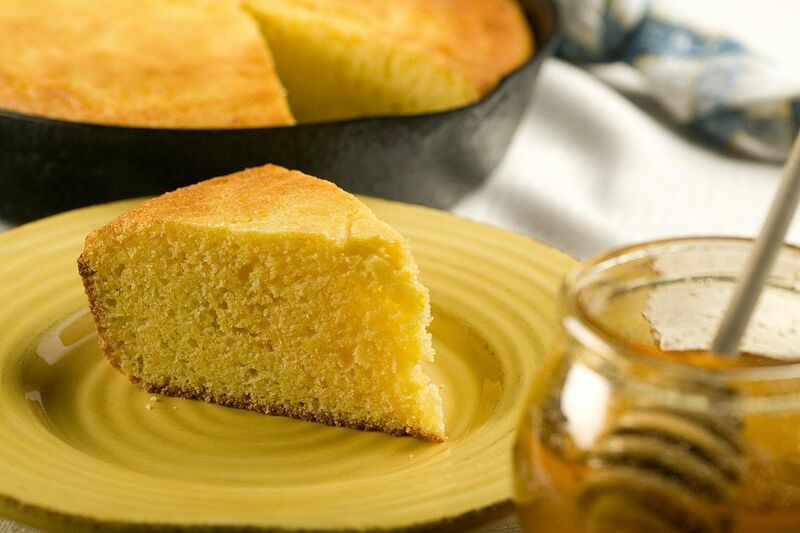 Cut cornbread into pieces, and slather honey butter onto the warm cornbread. The wonderful thing about cornbread is that it can be combined with several different ingredients to create both sweet and savory versions. For a recipe bursting with flavor, try a cornbread with sweet onion; the onions are first sauteed in butter and then mixed with the cornbread batter, sour cream, and cheddar cheese to make a moist bread with complex flavor. If you are having trouble getting your kids to eat their vegetables, a broccoli cornbread may be the answer. The bread comes out nice and tender due to the addition of cottage cheese. For a real treat, add a bacon cornbread with cheese to the bread basket at your holiday table. The bacon adds a welcome texture and is a natural match for corn and cheese. If, by chance, you have any of this cornbread leftover, there are a few interesting ways to incorporate the bread in recipes. You can make a cornbread salad with bacon, for example, chock full of vegetables and studded with pinto beans and shredded cheddar cheese all tossed with a creamy ranch dressing. Or, how about swapping out the white bread for cornbread in your stuffing—either a classic Southern recipe, a spicy cornbread stuffing, a vegetarian stuffing featuring cornbread, or even one made in the slow cooker. Cornbread is also delicious when combined with pine nuts, garlic, and sage and nestled inside a pork tenderloin before roasting.